It’s easy to forget that there is plenty of geology to see locally when your state is relatively flat. Northern Ohio is not only flat in terms of it’s topography – though, glaciers did do a number in that respect. It also served as the depositional environment for a shallow sea some 300-400 million year ago, and is far enough from the nearest orogenic zone to not have experienced much deformation, leaving us with (more or less) flat layers of bedrock. Because of this, I often like to dream of mountains and canyons in far off lands. But flat doesn’t always mean boring, and a few good outcrops can sometimes be just as satisfying. During a brisk January day, I set out on a hike to a local spot that I’ve heard about for years, but never been. It was only in the 30’s (Fahrenheit) that day, but was also bright and sunny…perfect for just such a hike! Our destination was a waterfall, locally well-known, but one I have never before visited despite my many years in the area. 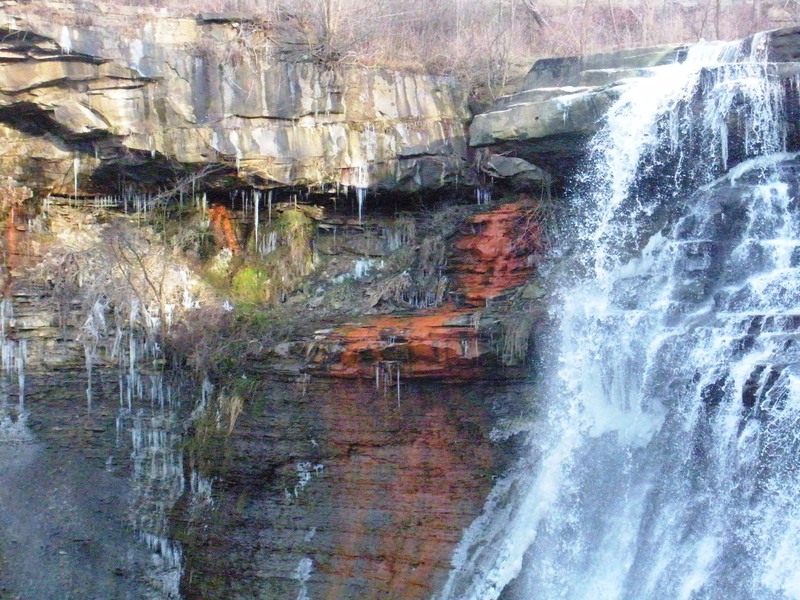 Brandywine Falls is located in Brandywine, Ohio along Brandywine Creek (got that?). 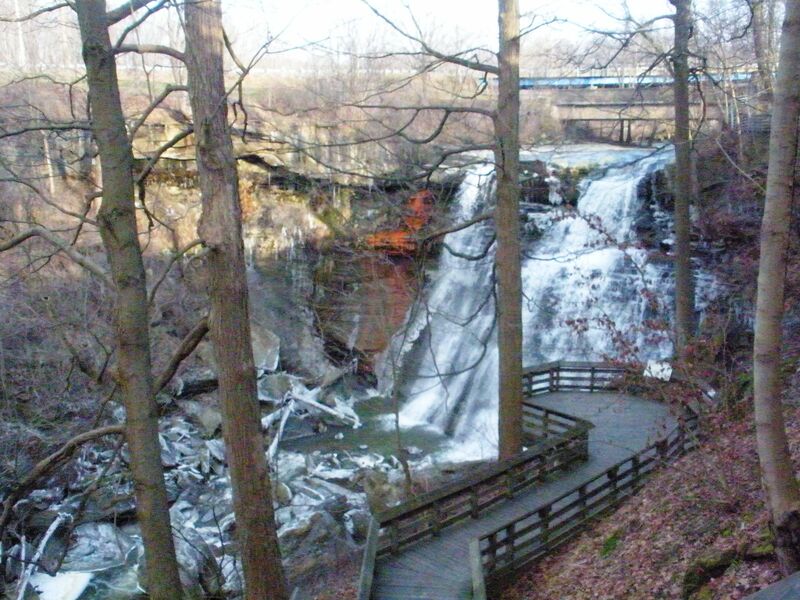 The Creek is a tributary to the Cuyahoga River, which runs through the Cuyahoga Valley National Park before flowing into Lake Erie at Cleveland. I picked a great route to hike to the falls, starting down by the Ohio & Erie Canal Towpath Trail (along which Chris Rowan and Anne Jefferson had a recent outing), following a tranquil, winding trail a little under 2 miles long. The trail makes it’s way through the woods and up the eastern valley wall to Brandywine Falls, which is right at the crest of the valley. The 60 foot high falls are certainly nothing compared to some more famous, but in those 60 feet, the water runs through a nearly 200 million year slice of geologic history. 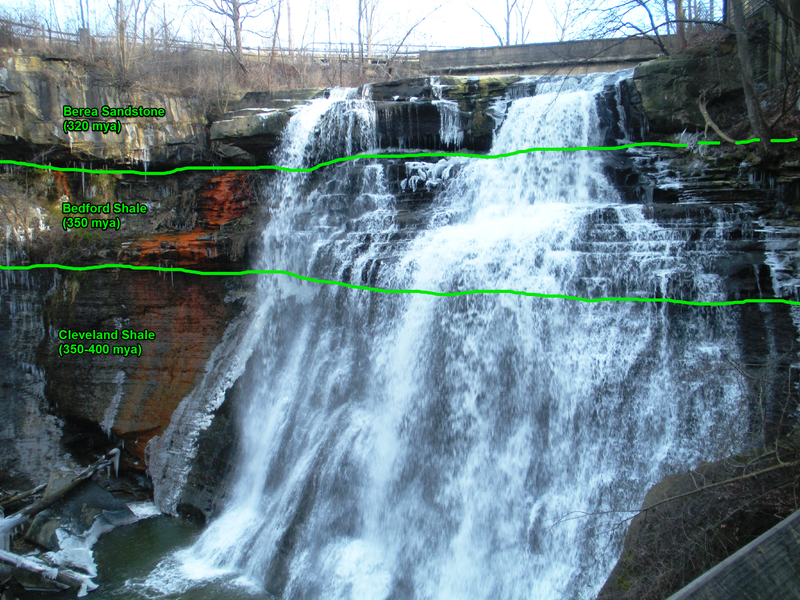 Aerial map of Brandywine Falls region. 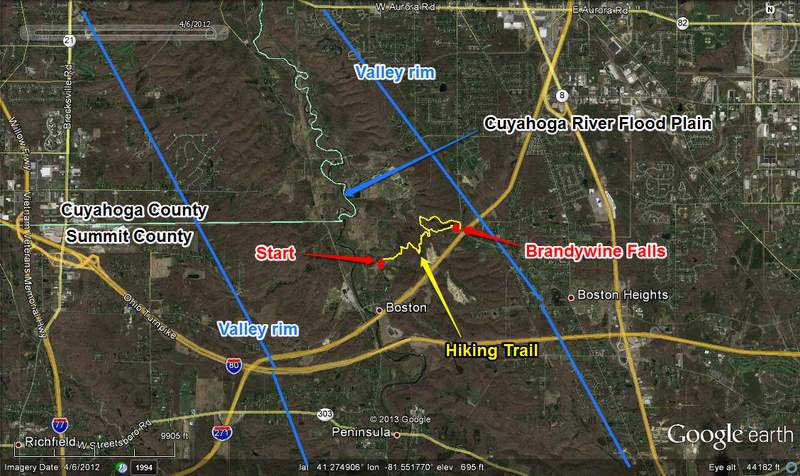 Graphics show the path of the hiking trail (yellow), the location of Brandywine Falls (red), as well as general constraints for the western and eastern edges of the Cuyahoga Valley (blue). As Brandwine Creek approaches the Cuyahoga River Valley, it runs over top the Berea Sandstone. From as early as the 19th century, this resistant rock was commonly quarried for mill stones and building stone due to it’s fine, but angular grains and uniformity. The grains themselves were transported here via streams from Canadian Shield (north) and the Cascade Delta (east), and deposited in the shallow sea that existed 320 million years ago. Eventually the creek drops down through the Berea, exposing and cascading over the underlying Bedford Shale. Because the shale is thinly bedded and fissile, it creates numerous “steps” which the water cascades over, creating a “wedding vale” appearance. Beside the falls, and all along/below this contact, iron staining is prevalent. The “wedding vale” is further accentuated when we go ever further into the past and cross the contact between the 350 million year old (mya) Bedford Shale to the nearly 400 mya Cleveland Shale which, although thinly bedded like the shale formation above, provides a rather shear drop for the bottom half of the falls. Both of these shales were deposited when the Ohio Sea was a little deeper (although still relatively shallow). The fissile Bedford Shale helps to create the “wedding vale” effect for the falls. A large block of Berea Sandstone lays here as a result of undercutting. Notice the frost-wedging action!! 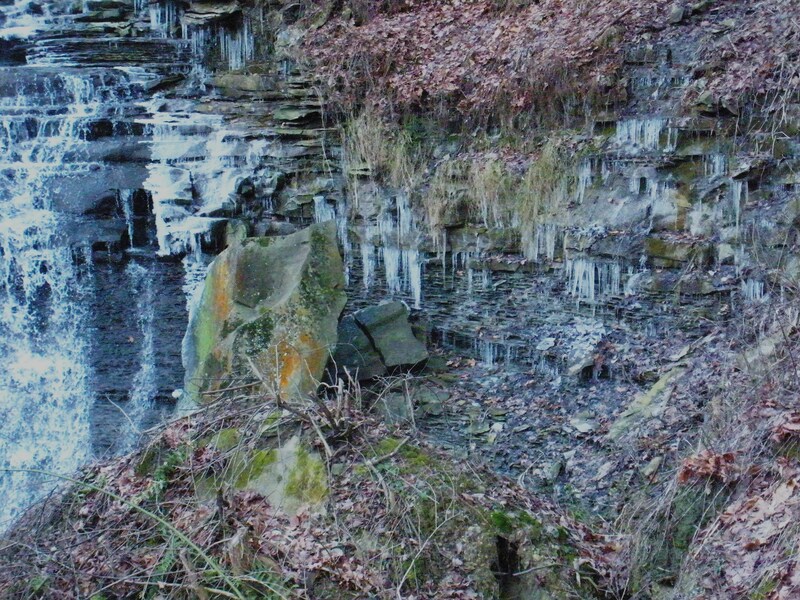 Due to the shales’ greater degree of weathering, it eventually undercuts the Berea, resulting in the occasional rockfall to occur, hence all the large blocks of sandstone at the lower creek level. Iron oxide staining on the rock face below the Berea Sandstone/Bedford Shale contact. All-in-all, this made for a pleasant stop on our hike, and one with an interesting geologic story to tell. I might make a return trip in the future to take some better pictures and highlight some of the rock characteristics like the great cross-bedding in the sandstone! 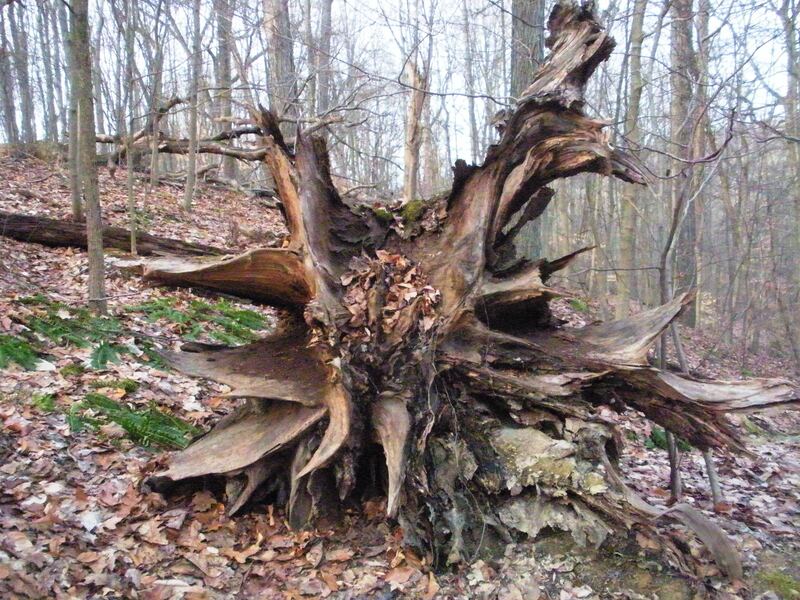 Until then, here’s a neat root cluster from a fallen tree that we came across on the way to the falls. A root cluster of fallen tree that caught my attention. Approx. 1 mile west of Brandywine Falls.